We’ve been in some pretty crowded elevators in our time, and the breath of those around us has not always been exactly ‘fresh’, so when Wrigley’s approached us to help support their Excel Gumergency campaign, we didn’t have to think twice. Wrigley’s hooked us up with the same giant pack of Excel gum used in the commercial and ad campaign and had us spread the good word about bad breath. 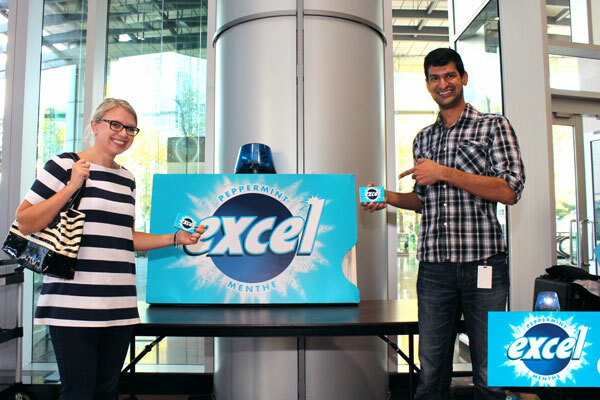 Those passing by could not only get their picture taken with the enormous gum pack, but they could show their support of fresh breath by sharing their photo via Twitter and Facebook with an iPad we had on hand. Guests also received some free gum, a small reward for fighting on behalf of the noble fresh breath cause.